There is a vast array of Samsung Galaxy S4 accessories available and battery cases can be extremely useful, especially for those who make heavy use of their phones. Battery cases can also be a bit pricey though, so today we have some details of a Samsung Galaxy S4 battery pack with real affordability. Meet the Brando Power Case for the Galaxy S4. This accessory not only brings protection to your Galaxy S4 but it also has the added benefit of a built-in 4500 mAh battery for charging while on the go. The Power case can be charged by USB cable and then simply plug the power station to charge the Galaxy S4 at your convenience. The phone slides into the portable battery and then it’s just a case of sliding the on-off switch to on. It features a flip cover and the power case also features a handy stand to hold your Galaxy S4 at good viewing angles. The Brando Power Case for the Samsung Galaxy S4 comes in black or white color options and is priced at only $36. This sounds like a real bargain when compared to the Mophie Juice Pack for the Galaxy S4. The Mophie battery case features a 2300 mAh battery and has received high praise, but the price is $99.99 and that’s a whopping difference. Features of the Brando Galaxy S4 Power Case include a see through window for Caller ID view and answering and a smart awakening function for saving energy. The power case is made of ruggedized materials for impact resistance against bumps, drops and scratches. The case also offers accessibility for all ports and function buttons and there’s a battery power indicator too. 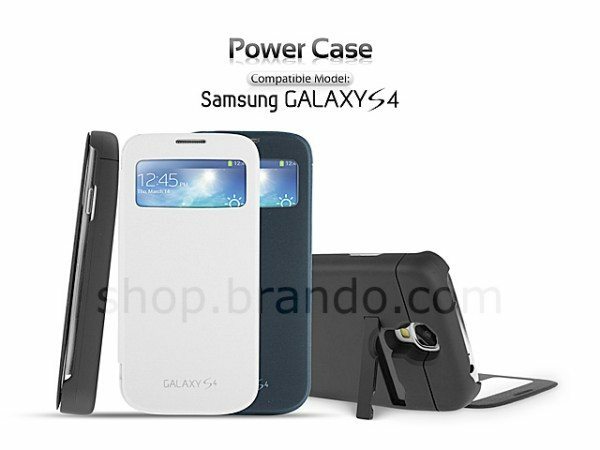 If you want to find out more about the Samsung Galaxy S4 Power Case then head to this Brando product page. Are you looking for a battery case for your Samsung Galaxy S4 smartphone? What are your thoughts on this Samsung Galaxy S4 accessory by Brando and the pricing? Let us have your comments.